I've finished my Granny Goes Large Blanket! It took just over a year, which is pretty quick when you take out the four months or so that I was unable to crochet due to my shoulder injury. The pattern is free and except for adding a few more rounds (I added eight or ten rounds, I counted but I can't remember what the number was now - I crocheted until I had just enough yarn for the edging), I followed it completely. It's made in Brown Sheep Cotton Fleece in the worsted weight. Cotton Fleece is 80% Cotton and 20% Wool. I used a 4.0mm hook. 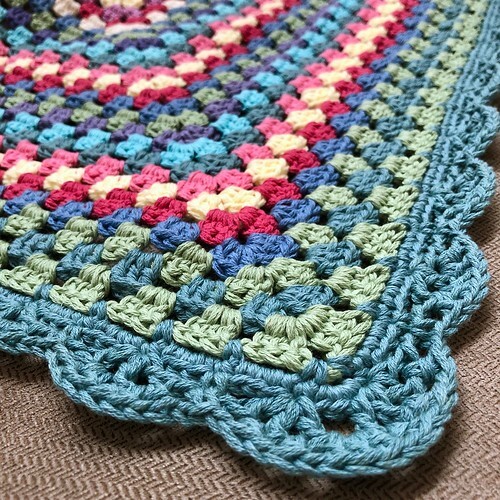 Granny squares (which is all the center of the blanket is) tend to twist and kind of rotate. This is because of the way crochet works. In order to keep it square, every round I swapped which side was the right side, meaning every other row actually switches direction in the way it's crocheted; and I also changed starting corners. Doing this worked and the blanket lies flat and square - about 72 inches square when it was all finished! I'm thrilled to have this finished as I think it's going to be great around here this Spring. 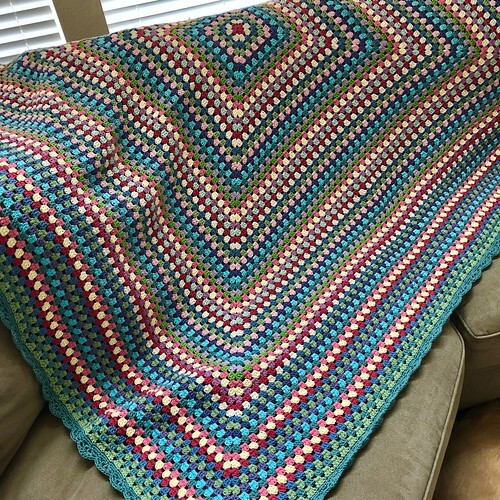 A cotton (mostly) blanket should be perfect for Texas!